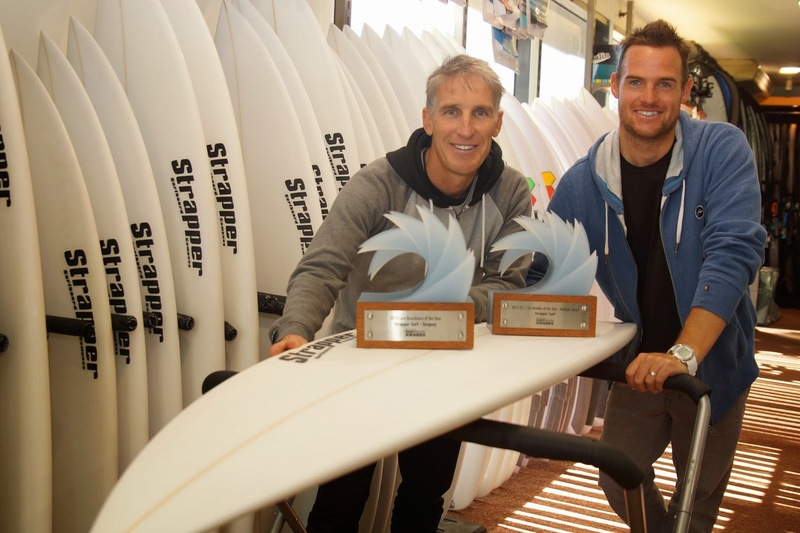 Last Thursday evening, local Torquay surf shop ‘Strapper Surf’, had the honour of winning the “Australian Core Surfboard Store” award in the SBIA Australian Surf Industry Awards 2014. As well as this; Strapper Surf Geelong, Ocean Grove and Torquay together won the “Victorian/Tasmanian Multi Store Surf Shop” of the year award. The Australian Surf Industry Awards pits retailers against retailers, brands against brands, for 33 awards across a number of categories including retail, product innovation and brand performance. The awards are presented by the Surf and Boardsports Industry Association (SBIA), now for the third year running. This is the Australian surf industry's biggest night of the year, having 220 surf retailers, brand executives and reps in attendance, as well as former World Champions, Mark Richards and Wayne 'Rabbit' Bartholomew at the Twin Towns Convention Centre on the Gold Coast. “We are honoured to receive these two awards. All credit to our Strapper Torquay team led by Shop Manager Dylan Schulze, our Surfboard factory led by Shaper John Robertson and all our Strapper crew, for sharing the surf passion. Also, a massive thanks to our loyal customers and Surf Industry suppliers for their support.” said Strapper owner, Mike Di Sciascio. In previous years, Strapper has accumulated an impressive score sheet, having won two awards in 2012, as well as being a runner up and finalist in 2013. These combined with this year’s achievements are unprecedented in the history of the SBIA Australian Surf Industry Awards. Hi I really appreciate your all efforts which is specially for the surfboard.